We think we know what a price is, but new kinds of markets require new kinds of prices. A price has a function, and that function has changed. We recognize that electronic markets and digital products have created a new age, but we seem to not recognize that these markets and products need a radically new approach to pricing. FairPay is a new concept of what a price is for these new markets. Expanding on ideas in Harvard Business Review, Marco Bertini and I have co-authored an article, "A Novel Architecture to Monetize Digital Offerings" that has been submitted to a leading journal for publication [now published in the Journal of Revenue and Pricing Management*]. Throughout most of the history of commerce, price was the outcome of a negotiation between individual sellers and buyers. Different buyers achieved different prices depending on their current situation, needs, and bargaining power. In other words, prices were very personal. Starting in the 1850s, however, the shift to mass retail shoved this tradition aside. Shoppers no longer bought from individuals, but from organizations interested in standardization and scale. Indeed, the price tag gained popularity in the early 1860s with the arrival of the department store—John Wanamaker, the trailblazing American merchant and religious leader, opined that if everyone is equal before God, then everyone should also be equal before price. The company dictated terms, with prices set to maximize profit or some other objective and offered to the market on a take-it-or-leave-it basis. Now that commerce is shifting back to personalization, it is interesting that one of its central ingredients, price, lags behind. Businesspeople appreciate that prices should be fitted to people’s personal valuations as they once were, but there is no real agreement on how this comes about. Specifics of how and why to do that are explained in the article (preliminary version online at SSRN). Additional background is in other posts on this blog. To be clear, our answer is not to try to somehow go backward to automate traditional negotiation. Instead we need to go forward with new ways to build relationships based on human values in a world of electronic markets and digital experiences. What we need is a totally new concept of what a price is, how it is arrived at, and why. The shift of commerce to the digital domain has forced many organizations to rethink their attitude to value creation, at times backtracking to the very question of what “value” actually means. Electronic commerce facilitates and thrives on social interaction, yet the way companies convert digital anything into cash they can bank seems to be stuck in time, obeying rules and practices that may have worked for physical goods but make far less sense today. We believe that earning revenue in the digital age needs a fresh approach. This short article seeks to lay the foundations for such an approach and proposes FairPay as one viable alternative. *The text here may not reflect final edits in the published article. Trial coupons (like from Groupon) can be a very effective way to attract new customers, but as generally done, this process tends to attract bargain-hunters who may not be the ones a business really wants to attract. FairPay promises to enable a better way to attract your real target market. FairPay is based on taking the risk of low payment on some product offers, in order to seek to build a profitable relationship with a prospect. The prospect is told that they can set their price as they think fair (possibly within limits), but that such offers will continue in the future only if the seller(s) agree the buyer's price is fair (based on individualized criteria). Unlike conventional coupon offers, which offers a pre-set discount, FairPay lets the buyer set their own discount, higher or lower, after they try the product or service. If the esperience was good, the discount is smaller, but if it was bad, the discount can be higher (possibly even 100%). This is attractive to those seeking fair value, by eliminating their risk of buyer's remorse. It makes trying new places nearly risk free (at least as to cost), and offers a fair discount for taking the risk of a bad experience, but can be selective enough to exclude those who just want a bargain and will never be good customers. In the case of a coupon aggregator (like Groupon), the aggregator would collect feedback from the buyer on why they set the price they did, and from the seller on whether the price seems fair, given those reasons and given other data about the buyer's values, demographics, and ability to pay. The aggregator can explain that they will develop a reputation for the buyer, and use that to target other offers (or not). Thus the buyer has a strong incentive to be reasonably fair. For example, for the case of a restaurant (which has significant marginal costs), the offers may be framed so that the buyer is told they can pay any price they want, but if not at least a target percentage (maybe 50%, maybe more), must explain why they think it is fair (with a few multiple choice questions that are easily scored automatically). They might also be told that a suggested fair price should be between 25% and 75% of the normal billed price. This reflects the objective of providing a discount for the risk of a disappointing meal, but with the idea that even a disappointing meal is usually worth something (say 25% of full price), and a very good meal deserves a good price, even as a trial (say 75% of full price). The buyer might be free to pay zero, but only in truly rare cases (such as for buyers that usually pay well) would that not be taken as a black mark on their reputation score that might exclude them from most or all future offers. This pricing might be set directly with the aggregator right after the meal (such as in a mobile app), who would then settle with the restaurant privately. Other kinds of service establishments could use a similar process. By doing this over a series of offers, the aggregator can characterize each buyer with a FairPay reputation, maintain that in a database (along with rich, transaction-level detail on what they pay well for and what they do not -- and why), and use that reputation data to target additional offers. Merchants most eager to attract customers will make offers to a wide range of prospects (with correspondingly high risk), while other, more successful or selective merchants might limit offers to those who have already gained a reputation for paying fairly (thus taking relatively low risk, and from more valuable customers). The aggregator can also limit the number of offers that a particular merchant makes to untested buyers with unknown fairness reputation, to limit the risk even for marginal merchants. The benefit to buyers is that those who are willing to pay fairly when they get value can be given trial offers for quality establishments that they may be likely to revisit. It can be made clear that buyers who price at above the suggested value can generally expect to become eligible for more attractive offers, and those who price below that value will generally get less valuable offers. Some will price for quality and style, and some will price for the biggest discounts they can get (if they do not squeeze too hard). Offer flow will vary accordingly. The benefit to merchants is that they can target the prospects most likely to appreciate what they offer, in a way that calibrates their risk. Some will seek new customers at relatively high risk, while others we be selective, and take little risk. *As a well-tested reference point in the non-digital world, consider the experience of many restaurants, theaters, hotels, and other businesses who have tried pay-what-you-want offers. These do not include any of the reputation tracking controls that FairPay applies to limit free-riding, but even with that limitation, PWYW has proven effective in many such situations. See, for example, references cited in my Resource Guide to Pricing , such as the one that studied the restaurant Kish. For a more widespread example, check out Panera Cares. The Complete Guide to Pay What You Want Pricing -- full e-book, with or without the Bonus package that includes my interview. Interview on FairPay, only -- standalone audio recording (40 minutes). Tom's e-book and related bonuses offer a rich and useful guide to using PWYW, and are full of insights and experience on best practices for making it work. PWYW draws on subtleties in human behavior -- it can be very powerful, but there is nuance to framing such offers, and making it profitable on a sustained basis is often difficult. My interview focuses on FairPay, and how it builds on the core benefits of PWYW, and goes far beyond conventional approaches, to make it more sustainable and profitable, and scalable to large businesses. Most uses of basic PWYW are for limited promotions. FairPay adapts it to be more predictable and workable for ongoing use -- whether on small scale, or for seller who aggregate items or offer ongoing subscriptions, even to the scale of Amazon or the iTunes Store. Doing that involves a number of component steps, as described in the interview and elsewhere on this blog. (An earlier post provides some diagrams that may be helpful while listening.) The interview also expands on the rationale for how FairPay applies to various business contexts, and the behavioral economics that show how it can be effective. I hope you will enjoy this material, and will want to use FairPay to take your business to the next level. Comments are welcome, and I offer free consulting to those with a serious interest in considering FairPay. The recently introduced Times Premier premium subscription service provides a nice case study of the problems with conventional pricing models for digital content, and how the more adaptive model of FairPay promises to do much better. [Update 1: Apparently Times Premier did not meet objectives and was re-introduced in 2015 as Times Insider. The differences seem insignificant with regard to the points made here. "For those with a curiosity that matches our own," the Times' pitch reads, but what I am most curious about is whether and how I would value it. ...And whether the value to me would be consistent, or highly variable and hard to predict. The Times' metered paywall has been working better than many feared, but is obviously leaving money on the table from loyal, engaged readers who can and would pay more for Times' journalism and extras. Premier attempts to capture that value, but, like the old "Godfather"-inspired joke, they have made me an offer I cannot understand. It offers me a combination of new features, some in specific quantities. I don't know what these are, have never seen many of them, have no idea if I will like them. And, even if I do like some of them, how many will I want in any given 4-week cycle? I can afford the extra $10 per 4 weeks cost,* but have no confidence I will value the service. Maybe I might try it and, if not too disappointed, just continue to pay the $10 without much thought (as the Times might hope) -- but profiting from my inattention leaves me feeling exploited. Alternatively I might try it for a while, then cancel -- even if I would be willing to pay something for the occasional feature -- leaving both me and the Times losers. In any case, I feel little temptation to even bother -- again leaving both me and the Times losers. The core problem is a rigid, one-size-fits-all pricing scheme for a time- and quantity-varying experience good that is offered to diverse buyers with different and time-varying needs. The Times identifies me as a current digital and print subscriber, and offers to let me try Premier on a FairPay basis, as a "patron" of their quality journalism. They "bill" me in arrears on a pay what you want basis, telling me for the past 4 weeks how much of each Premier feature I used, and advising me of a suggested price based on that usage and my history. The suggested price may reflect volume discounts and a maximum for "unlimited" use, and may have adjustments for students, disadvantaged, or affluent patrons. They try to nudge me to pay well by reminding me of their quality journalism, telling me that others are paying much as they suggest, and offering added incentives. I decide whether I think it is fair to pay as suggested, higher, or lower, and check off possible reasons for that. The Times weighs the reasons, considers my history, demographics, and usage, and decides how fair my price seems -- on an individualized basis. After a period of probation, the Times decides whether to continue as is, bump me up to more privileged offers, or drop me from FairPay pricing and require that I pay the standard $10 per cycle if I want to continue Premier. This dynamic adaptation continues indefinitely, as the product and the relationship change and evolve. It builds a true patronship relationship where I feel empowered, participate in real dialog about what I do or do not value, and build on my experience with the Times and my reputation for fairness. It encourages me to recognize the value of what I get from the Times, and to reward them accordingly. It lets me try Premier at no risk, but (optionally for the Times) with the understanding I am expected to pay, even for the first 4 weeks, if I find value in it. Each cycle, I can pay as suggested based on my usage -- or more or less -- as I wish. If I have an occasional heavy usage cycle, I can apply whatever "volume discount" I like to avoid an unduly high charge, as long as I don't abuse that privilege. If I thought the features were especially good that cycle, I can pay a bit more, and increase my fairness rating to show my "patronship" -- and earn more priviliges. If I thought the features less good that cycle, I can pay less, and only harm my reputation and privilges if I make a habit of devaluing the product. They can get far more people to try Premier, and retain far more, for wider market reach and greater profit. Many may pay less than the standard $10, but some may pay more, generally in line with the value they receive. The net profit can be higher, with a lower average price, but from more patrons. Since Premier is a new offering, they would not risk cannibalizing existing revenues. Even after it is new, an added FairPay option could extend its reach down-market, and add more premium revenue up-market. They can build a deeper relationship with their patroms, based on this deeper empowerment, dialog, and experience. That can shift the relationship with the Times from quid-pro-quo business exchange norms to cooperative, communal norms, and fosters social values of fairness and reciprocity, both of which increase willingness to pay. They can learn far more about what their patrons value and why. They can justify different prices to patrons with different value propositions and abilities to pay. They can start with fairly simple decision rules and liberal continuation criteria, and gradually add more nuance and discrimination as they and their patrons gain experience with the process. Trying a radically new approach like FairPay has risks, and takes some effort, but I suggest that a FairPay version of Times Premier offers far more profit potential and far better relationships with the Times' patrons than the conventional version. Time will tell. [UPDATE:] I did try Times Premier, and cancelled after the four week trial. As I feared, the value of offers was very episodic, and a constant subscription price makes no sense when my usage and value varied widely from week to week or month to month (much of the time low). The insider features at the time were not of great interest to me (the David Carr item that was of interest came up weeks after I cancelled). The free e-books were only specific titles that were not the ones I would have been interested in. If I could have run-of-the-house access, and pay commensurate with what I actually found interest in (as FairPay would permit), I would have been very willing to be a patron. As far as I can tell, not very many others have found this offer attractive, and readers I have talked to about it saw little appeal. *My print insert offer says $10, but the Web page says $11.25. The print insert offers a free 4 week trial, but the Web page asks for $0.99. Seller pricing manipulations that are hardly endearing to patrons! Pricing for digital offerings continues to be a fundamental challenge, and the debates over free, paid and freemium rage on. "Making 'Freemium' Work" by Vineet Kumar in Harvard Business Review (5/14), nicely sheds light on companies' real world experience with freemium, highlights the challenges of making it work, and suggests how companies can tune it to get good results. ...a new strategy beyond freemium that addresses the same business needs, and exploits the attraction of "free," in a way that promises to be more powerful and flexible. We motivate this as moving the exchange between seller and buyer from the transactional to the relational, based on three pillars of relationship: empowerment, dialog, and experience/reputation. The six questions raised here are important to this new strategy as well. Freemium has offered a good start to dealing with new economics of digital offerings, but this new strategy, called FairPay, takes the driving objective of freemium - exploiting "free" to move toward a profitable relationship over time - and makes that the driver of a variable boundary between free and paid tiers. 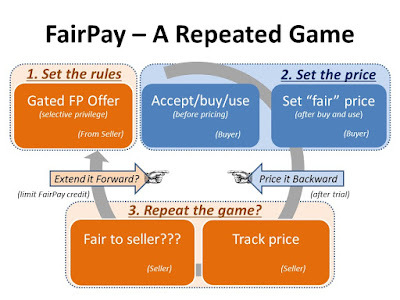 FairPay moves the strategic question of what to exchange at what price from a pre-set seller decision to an emergent, dynamic process that balances the interests of the seller and different individual buyers. That provides more nuance and flexibility than freemium's gross segmentation into just two (or a very few) set tiers (free or paid). We suggest the more individually adaptive techniques of FairPay can be applied to get better market reach and profit, and to build deeper and more profitable long-term relationships. 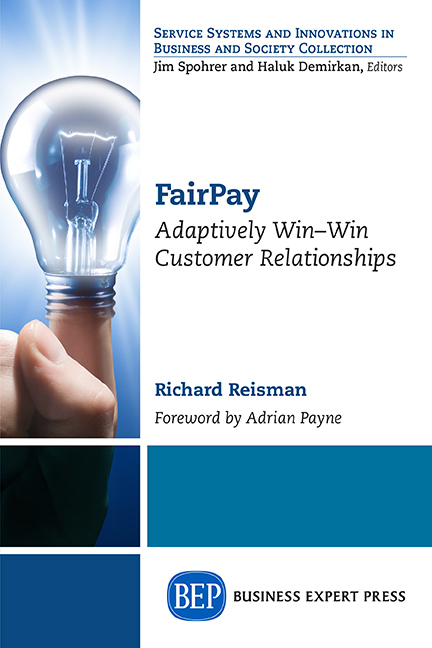 The six questions identified in this article remain important: FairPay provides a systematic method for (1) adapting (and softening) the boundary between free and paid, focusing on (2) customer understanding and (3) conversion rates, (4) evolving over adoption life-cycles, (5) encouraging referral incentives and communications, and (6) guiding ongoing innovation. With both freemium and FairPay, we see an opportunity to move beyond the debate over free vs. fee, to focus on empowering and communicating with customers and finding ways to reward those who opt to pay. How FairPay does this is more fully explained elsewhere in this blog and related Web site (see sidebar), but here are some comments specific to Kumar's six questions. Do customers fully understand the premium offer? FairPay is built around a structured dialog about offers and value received, and lets customers in good standing try both regular and premium offers whenever they want, and then determine the value they see in it. The seller highlights the value, based on their individual usage patterns, and if a buyer does not value it enough to satisfy the seller, that buyer's trial of a premium service can end (but it can be extended long emough and often enough to be a proper test -- at any stage of the relationship). The basic process is structured, but lightweight, informal, dynamic, and intuitive. Are you prepared for the conversion life cycle? As Kumar observes, early adopters are less price-sensitive than others, and are often people for whom the value proposition is unusually compelling. Freemium has no way to adapt to such variations over time, except to move the boundary for everyone. 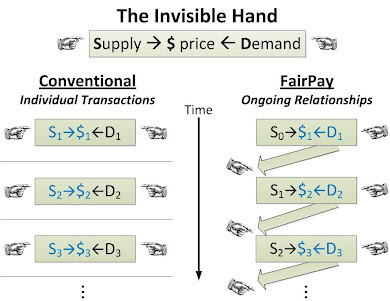 The core process of FairPay is driven by ongoing dynamic adaptation to different price-sensitivities and value perceptions, so identifying and dealing with such individual behavior is baked in to the process. Are users becoming evangelists? Free users can have value as evangelists (as Kumar notes) and also as a target for advertising (a key revenue source for many services), and viral marketing can be very important. FairPay can accommodate whatever value factors the seller and buyer choose to consider: Free users can claim credit for evangelism and receiving and acting on ads, and viral offers can draw on the same process to offer FairPay "trials" that suggest pricing with a trial discount that encourages those new users who do see value to start paying something immediately or very soon (while still letting those who try it but do not acknowledge any value pay nothing). Are you committed to ongoing innovation? Freemium is very focused on customer acquisition, but FairPay is designed to do its adaptive work throughout the life cycle, as usage and understanding of the product matures and changes over time. Because it is based on an adaptive value discovery engine that always sets prices in accord with current perceived value, it works throughout product and customer life-cycles, and continually drives the seller to make more desirable offers, based on detailed, real-world customer preference data. FairPay offers the potential to not only serve as a pricing engine, but also to serve as an engine for partly automating product innovation, as well. Detailed value perception data can be used to drive offer bundling and product development. So, once you get FairPayworking adaptively to set near optimal individualized prices, why would you drop it for a less adaptive alternative? If things are stable it works near optimally, and if things are changing, it is a nealry ideal tool to identify and adapt to the changes. Kumar's article provides a nice framework for understanding both freemium and FairPay. Pricing is the heart of commerce, and is never simple. Debates over free versus paid tend to oversimplify and overgeneralize. One post specific to the free vs. paid debate is "Free AND Paid! -- To Each His Own Price." Other commentary on why and how I think FairPay will provide an architecture for better pricing that subsumes both free and paid are throughout this blog and the FairPay Web site.